LAWRENCE — Deteriorated or outdated bridges along the less-traveled back roads of Kansas are a budget dilemma for county leaders throughout the state. A new report from researchers at the University of Kansas School of Engineering provides county leaders with a tool as they decide the future of bridges on rural roads with extremely low vehicle traffic counts. The Kansas Department of Transportation provided $20,000 to fund the study. Seventy-eight of the state’s 105 counties have bridges on low-volume rural roads in dire need of repair, replacement or removal. With an estimated cost of $150,000 per bridge – and nearly 1,000 bridges across the state in the structurally deficient or functionally obsolete categories – replacement bridges are an expensive proposition. The study provides a cost-benefit analysis on replacing a bridge compared to the cost of traveling extra miles to detour if a bridge is closed and removed. “This study only investigated bridges located on two-wheel path roads. That could be gravel, dirt, or sand. We estimate these roads would have extremely low daily vehicle counts, 25 a day or less,” said Tom Mulinazzi, professor of civil, environmental and architectural engineering, and one of the authors of the study. Researchers did not gather individual vehicle counts from each bridge in question. They simply used the presence of a two-wheel path road as a method to estimate vehicle counts. 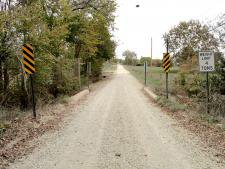 The study analyzes potential detour routes for all 992 structurally deficient or functionally obsolete bridges on rural Kansas roads with fewer than 25 vehicles a day, the vast majority of which are in the northern and eastern parts of the state. Nearly two-thirds (648) of the bridges would lead to detours of two miles or less if they were closed. The greater the detour distance or the higher the vehicle count, the greater the benefit in replacing a bridge. “One of the bridges we analyzed would’ve resulted in a detour of nearly 20 miles if it was closed. We know that’s not feasible. We also took into account whether closing a bridge would leave anyone without vehicle access to their property. In those instances, repairing or replacing a bridge is really the only option,” said Eric Fitzsimmons, postdoctoral researcher in civil engineering. Fitzsimmons, along with Steve Schrock, associate professor of civil, environmental and architectural engineering, co-authored the study. Due to the structure type of many of the deficient bridges or the type of deficiency, repairing the structure is not always possible, so options may focus on replacing or simply removing the structure. County administrators need to determine an economical plan to close or repair rural bridges while considering the safety of drivers. Low-water stream crossings are often considered by county officials but may not offer the desired level of safety for motorists. It’s hoped the research will aid county leaders in the planning and budgeting process. “This study was designed to be a tool based on very simple data that county leaders can easily understand and use as they weigh the financial and political costs of closing or repairing a bridge,” Fitzsimmons said.